It’s been raining so much. Luckily, these dried. my second shower today was thanks to Providence’s drivers and its corpulent corps of incompetent civil engineers. Remind me again how Providence’s unique geological and geographical properties make it difficult to drain? Thank goodness I got to run before this outpouring. 4 hours of dance on a school day? Only at the beginning of the semester. 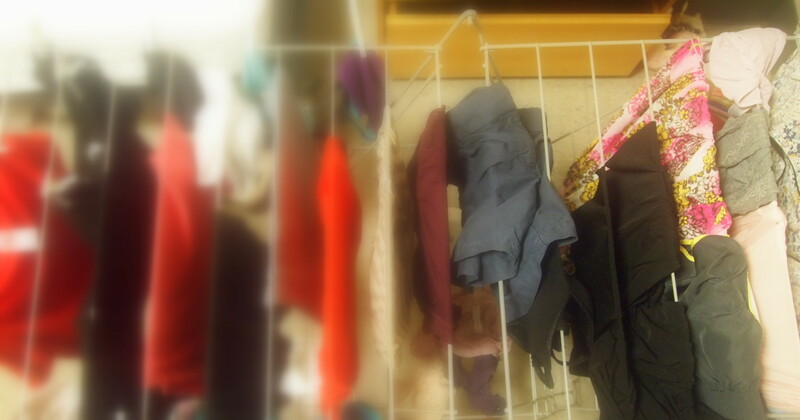 I brought back a drying rack because I have lots of floor space and an unwillingness to let my actions be limited by having to wait for an hourlong drying cycle. I took it out of the packaging today. It is huge! a small and very light child could probably sleep on top of it, and then a very very tiny puppy could use the legs as an ineffectual doghouse. But when it lost a dimension, it made an awful clattering noise. Gosh I didn’t know projection was so jarring. I also had garments on the floor. This afternoon I made my foot point in a pointier way that it ever had before. Normally it starts to cramp if I push my toes that far, but today it seemed to be ok with it. I don’t know why I care so much about my foot’s range of motion in that direction: I guess it’s because they’re so wide that I can’t really wear awesomeshoes in any practical setting. I went home this morning, and, because I am a giant plant and had gotten my fill of sunlight, I went on a search for sugar and water. Back at school — minor anxieties, but things generally going well.